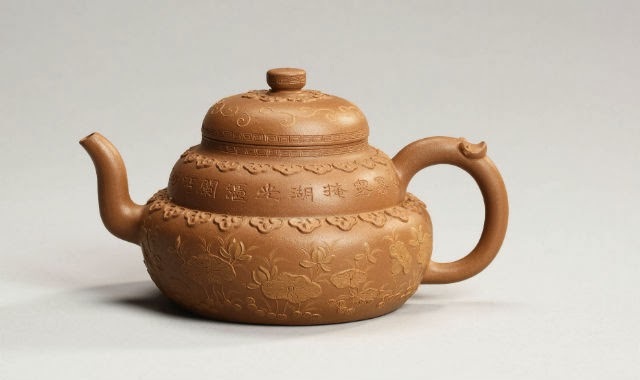 A rare Yixing stoneware slip-painted and appliqué-decorated ‘lotus’ teapot with the Qianlong seal mark, estimated to be worth between US$650,000-$770,000, will likely be the top lot from a collection of Yixing stoneware teapots and scholar’s objects, going under the hammer at Bonhams Hong Kong on November 24. The single-owner collection amassed over almost 30 years by Mr and Mrs Jimmy Sha consists of 22 Yixing pieces, some of them commissioned by the Chinese Emperor and crafted by famous potters and eminent scholars of the Qing dynasty. The collection also includes three teapots made by Gu Jingzhou (1915-1996), one of the best known Yixing potters of the 20th Century.